Happy New Year! I wish you all the very best in 2015! We've been having lots of family fun over the last week and while I have sneaked a few peeks at blogland, I haven't had much crafting time. Until yesterday, when I remembered that it's my turn to host this month's One-Layer Simplicity challenge! I knew I wanted to host an 'opposite' challenge - use as many opposites as you can. I sat down with a piece of white cardstock and the Simon Says Stamp sentiment. I figured black and white would do as a start. But then I started playing around. And look what I did! I sponged the circle using a mask and Salty Ocean and Spiced Marmalade inks. Then I added the tiny dots to get a more festive feel. So now this card has black and white. Circle (image) and square (card). Little and big (dots). Top and bottom (within the large dot). Blue and orange (opposites on the colour wheel). Curves and straight lines.Thick and thin (text). Print and script. Caps and lowercase. Sponging and stamping. OK, those are not strictly opposites, but that's still a lot packed into this simple little card isn't it? I hope I've managed to get you thinking about other opposites and that you'll play along with us - you have until January 24th at midnight to link up! Happy New Year to you and your family. This is one sweet card and I love all the opposites too, you are always so creative. I did not pick up on ALL the opposites til you pointed them out Ardyth. I love your happy card and love this idea. Good one. Happy new year Ardyth! Wow! The number of opposites you created is incredible! Sweet, CAS card! So definitely the opposite of unimaginative!!! Happy New Year! Your opposites on this one card are amazing. All those opposites in this CAS card - you did good! Happy New Year mf and I am looking so forward to your [amazing] 2015 creations!! Oh, this is such a fantastic card, and clever in all the right ways. Fun challenge idea. Happy New Year. All of your opposited have me so intrigued!!!! Getting my thinking cap on for this one......! Wow! That's quite the list of 'opposites'. Thanks for 'splaining all of them cuz I would have been hooped after the orange & blue colors! I bet you are REALLY good at 'finding Waldo'! 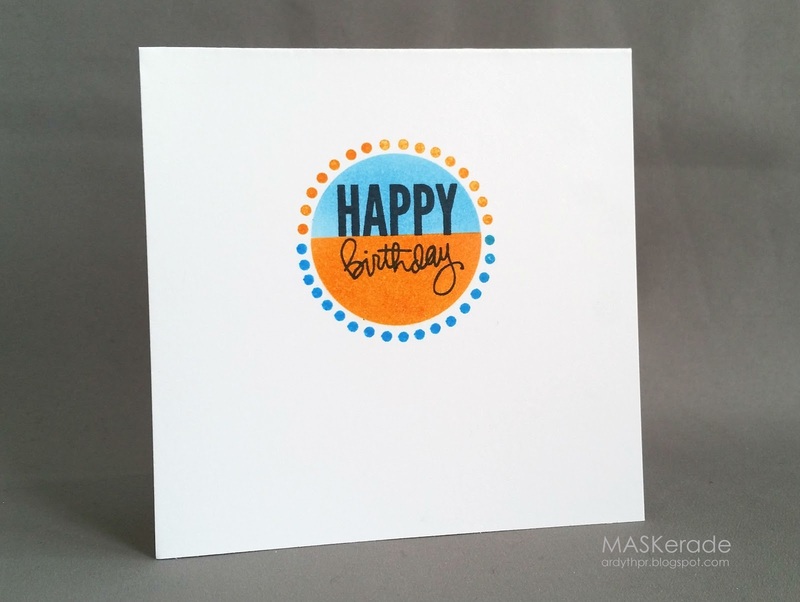 Fabulous card - really love the split color design. You are such a thinker ... I love that! This reminds me of taking the letters in a word and seeing how many other words you can make from it ... I feel the need to take your card and see how many opposites I can find. Apparently there are a lot of them! Way to get us thinking, Ardyth. AND, I keep hoping that one of these years you will do a Year In Review post. I'm dying to know which cards you love the most. Please?!! Fantastic looking card. You are a genius!